I realized that I forgot to post about the Percy Jackson party we threw months (years?) ago when the movie was coming out! Oops! I am posting it anyway because we had a lot of fun, even though I was the only girl there. Prep for this was pretty simple, the only thing I made was the lovely hydra archery target (we used a Nerf bow and arrow set so the kids could practice their archery--huge hit!). True story: I was drawing the tongues on the heads when this middle school boy walks over and says "Nice hydra" all nonchalantly! He did that whole appreciative head lift too. If I remember correctly, I looked at some hydra coloring pages on Google Images and then used that as the basis for mine. 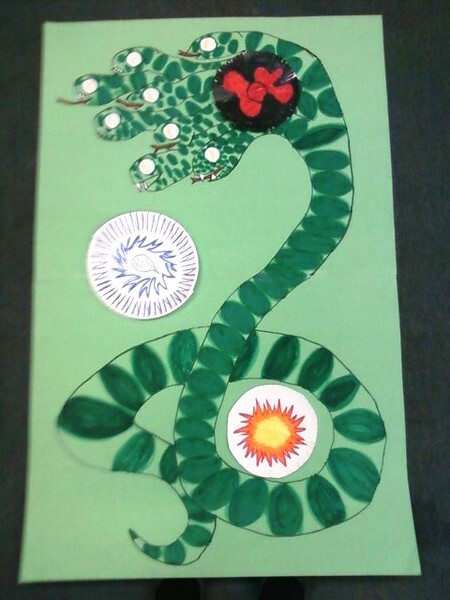 If I had to do it all over again, I think I'd have cut the snake hydra out and glued it on to a different color of posterboard for more contrast, especially with the scales. If you're more comfortable tracing, you could print a coloring page onto transparency film (I just put ours through my regular printer to make a mermaid for the 2010 summer reading program). Then you can use an artist's projector or overhead projector and project the image to the wall. Then you tape up some posterboard and trace. We did several ideas from the Percy Jackson event planning kit. I also put together a PowerPoint Monsters game, where I put an image up of a mythological creature and the kids raced to name him/her/it. Unfortunately, I can't find the file for that. We also did Percy Jackson madlib game (download). I think the idea for that came from PUBYAC. To promote the party, I put a book display out with our flyers (sorry, no file for that anymore either!). You can download the sign I made to go with it though.